It’s time to meet Amanda! This past April (the 4th to be exact), both Al and I ran in the YMCA Bunny Run 10K. After crossing the finish line, this gal walked up to me and thanked me for being her rabbit. She said it was her best race ever and it was because I pushed her. I was HER rabbit. I’ve never had this happen to ME before. I have thanked people for being MY rabbit, but I, myself, have never been a rabbit for someone else. What? Rabbit? Yes. Rabbit. Every time I run a race, I find someone who is just ahead of me and I chase them, like a greyhound chasing a rabbit – or typically in my case – the slower turtle chasing the faster rabbit! Sometimes, I actually pass the rabbit, but most often, I just chase them. It makes me run faster. I focus on them and try to keep up. It’s a fun little game I play. Whatever works, right. Anyway, I apparently was Amanda’s rabbit that day. I do have to say, I was completely flattered by the fact that I was someone’s rabbit. I remember how awesome it made me feel when she thanked me. I thought it was pretty cool and it made my day. Three weeks after that bunny run (April 23-26), I found myself in Des Moines, Iowa at the Road Runners Club of America Convention becoming a certified running coach. Not really sure what I had planned on doing with that certification, I just knew I wanted to become a running coach and a certified one at that. Then, fast forward to the first Sunday in May (May 3rd) and I found myself at a Tabata training offered through NETA (National Exercise Trainers Association) that took place at our college here in Alexandria. One of the gals was very familiar to me, but I couldn’t quite put my finger on it. After the class participants introduced themselves, I discovered who it was – it was Amanda, the same gal who thanked me for being her rabbit. We hit it off right away and chit-chatted after class. 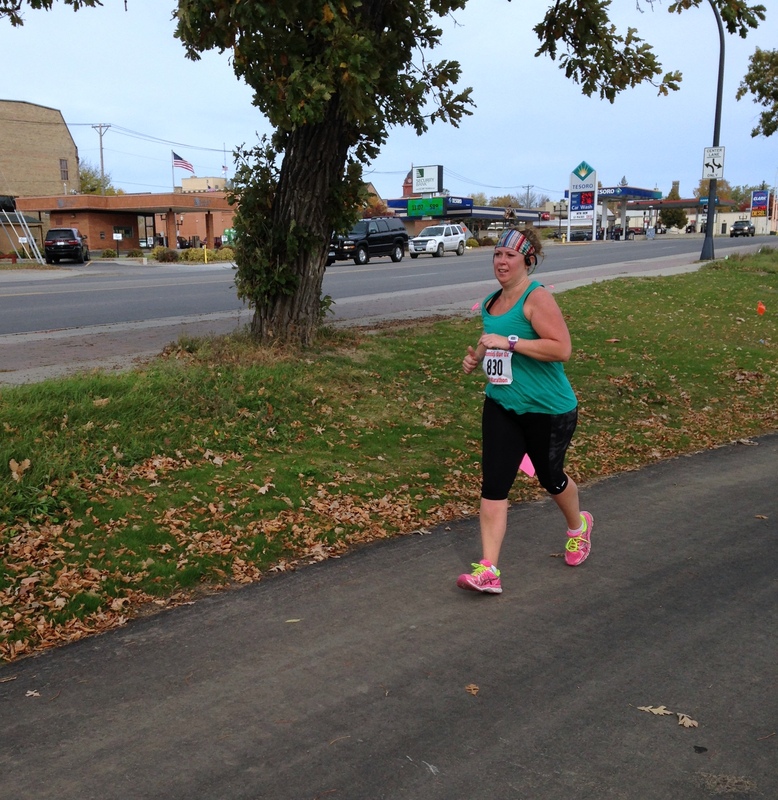 I found out that she and a friend, Tonia, were running the Fargo Half-Marathon the following Saturday. She explained that she didn’t know how they were going to get their packets and I offered to pick them up for the both of them and then they could meet us before the race at our hotel. It was a great plan. We exchanged information – cell phone numbers and of course, became friends on Facebook! The following Saturday, Amanda and Tonia picked up their packets and went about their merry way. It was amazing to me that after only meeting Amanda those two times, I felt a connection. It was really kind of strange. Both her and Tonia were so sweet and friendly and genuine. This may sound funny or weird or I don’t know, but they were real. Down-to-Earth, you know what I mean? I had learned that Amanda was a group fitness instructor at the YMCA, mainly doing water aerobics, but also other classes as well. I remember sending her a Facebook message with the plan I made for my first group fitness class that I was going to teach to get some feedback and she provided me with some great information and a good website for looking up fun exercises – PopSugar Fitness. This is now one of my go-to sites. And it turned out, Tonia ended up taking my first outdoor 6-week bootcamp I taught. So cool, huh! Anyway, now let’s fast forward to May 15 – about a week AFTER the Fargo Half-Marathon. Amanda contacted me via Facebook message and said, “You said you just got certified as a running coach, correct? Tonia and I were wondering what you would charge to train us to run faster? We can do the distance, but we want to do it faster.” I immediately let her know that yes, I had been certified but that I hadn’t gotten my certificate and I really didn’t know what or how I was going to do things. I needed to contact some of the other coaches and get ideas and, I needed to do some research to figure out what to offer, what to charge, etc. Basically, I just needed to get everything figured out. Eventually, I did. And, I had my first running client. 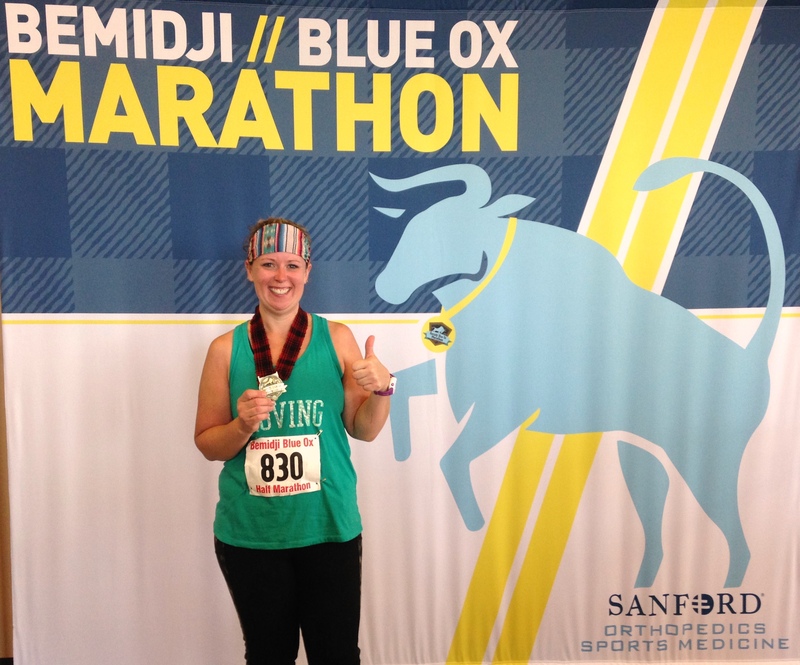 Amanda hired me to help her reach her goal of finishing the Bemidji Blue Ox Half-Marathon in a time of two hours and 30 minutes (2:30). Amanda finished the Fargo Half-Marathon in 2:41:44. She wanted to trim more than 10 minutes off her time. I knew it was doable if she was willing to put in the work. And, she was. She definitely was. I sent her a questionnaire to fill out and then I got to work coming up with a program for her. I have to admit, I was nervous. She was putting all her trust in me. A newly certified running coach that honestly, felt like she had no idea what she was doing. And that is the truth. It really was scary. But I had to rely on what I learned and the resources I had. I finally came up with a 12-week plan for Amanda and we had our first meeting. I knew after meeting her again that she was dedicated and ready to tackle my aggressive plan. She had her work cut out for her, but I knew she had it in her. I knew it was truly doable. Throughout the 12-weeks, there were Facebook messages, text messages, phone calls and we even got to do one run together. And, just like I thought, Amanda did awesome! Seriously, I was so proud of her. I pushed her out of her comfort zone and she didn’t bat an eyelash. She did great. Awesome, in fact. I can’t explain the feeling of having someone depend on you in the way Amanda depended on me. Being a coach is different and hard to explain. But I have to say, it is VERY rewarding. I loved every minute of it. Time to fast forward. To Saturday, October 10. The day. Amanda’s half-marathon. Because it was in Bemidji, which isn’t too far away and because there was also a 5K race the night before, Al and I decided to head up north so we could cheer Amanda on. I wasn’t going to tell her at first, but then I couldn’t handle the excitement and blurted it right out to her. I told her I would be there to cheer her on and hopefully give her the motivation she needed to reach her goal. The 5K Friday night went great for Al. Me, not so much. I didn’t run it. Stupid foot issues. But, in all honesty, it was kind of fun just being a cheerleader! 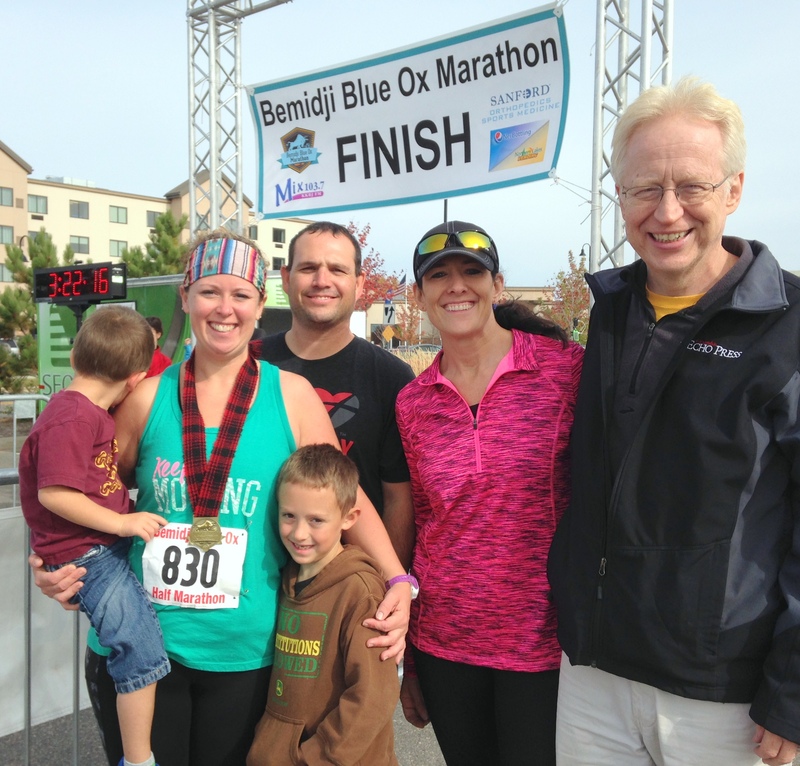 You can read more about the Bemidji race and more by clicking HERE. I have to say I was little nervous Saturday morning. I knew deep in my heart that Amanda was ready, but I will admit, I was still nervous for her. And nervous for me. I knew how bad she wanted this and that made me want it just as bad. As a first-time coach, I wasn’t sure what to expect. I knew that even though I came up with the plan for her, she is the one who did the work. In order for her to reach her goal, she had to follow the plan I presented her with. Yes, I designed the plan based on her abilities, goals, schedule and more, but she was the one who did all the work. All the hard work! And, she did it. She really, really did it. Actually, Amanda not only reached her goal, SHE CRUSHED IT! 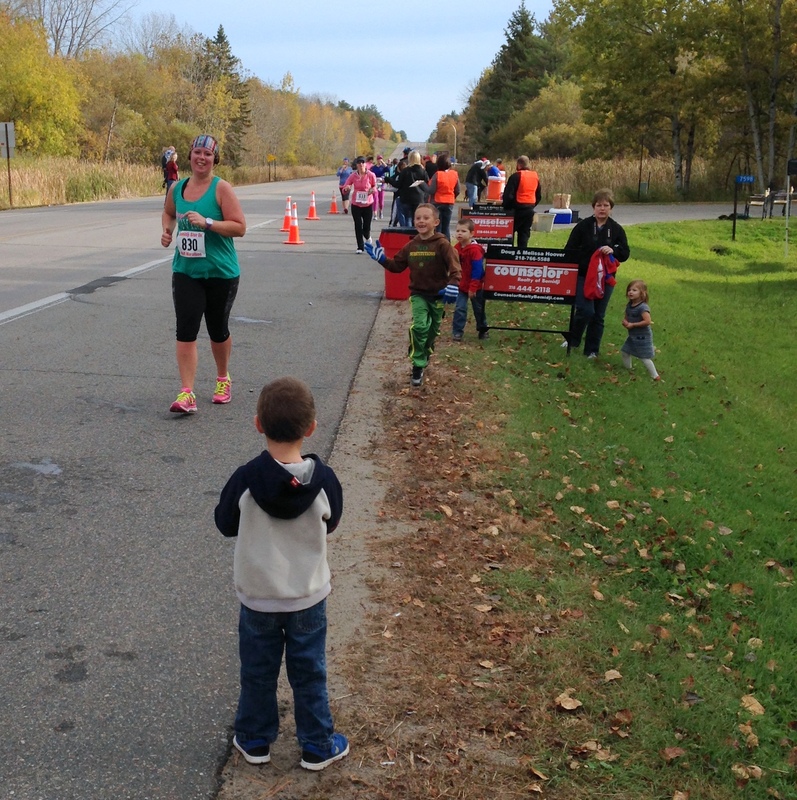 She set her sights on finishing the half – her third half, by the way – in two hours and 20 minutes. She finished in……. Yep. Nailed it. Crushed it. Beat it. Worked for it and reached it! I don’t think either us expected THAT. But it was AMAZING! After she finished and got some refreshments and sat down to soak it all in, I asked Amanda if she knew how well she did. She didn’t because her watch didn’t sync right away and so her time was off. I had her official results on my phone and I asked if she was ready to see how well she did. She was nervously shaking and so was I. I couldn’t wait to show her. And of course, when I did, there were tears – from both of us! I have never been so proud of someone like that before. It’s not like she was a stranger, but at the same time, it’s not that I know her inside and out. Yet at the same time, I felt like I did. I felt so close to her. It truly was an awesome moment. And one I will never forget. Will I be at all my clients races? Nope. I won’t. But I had to be there for my first. And I am so glad I was. It was such a surreal moment for me. As I know it was for Amanda. One proud runner with one proud coach! This was getting close to the end. Look at that determination! This is at one of the water stops. The boy in the green pants and brown sweatshirt is one of Amanda’s boys and the other one is in the jeans and the black and gray sweatshirt with his back turned. Amanda’s boys were so dang cute. I had so much fun with them. Amanda’s husband, Kevin, was also there and I have to say, he is one of her strongest supporters. Here’s another picture of Amanda’s boys. Seriously, I am telling you, they were THE cutest and such troopers along the route. They were cheering and having so much fun. That is one happy runner right there. Again, I am so proud of her. She ROCKED IT! Amanda with her cheer team! I asked Amanda if she would write a little testimonial after the race and she did. Here is her LITTLE testimonial! Thanks again, Amanda, for putting your trust in me. You were the very BEST first running client a coach could ever ask for. Since I started my running addiction, I have been a self-taught runner. With the help of the Couch-to-5K app, I went from not being able to run more then a minute to just completing my third half-marathon. I’m not fast, but I have the heart of a runner and I am always looking for or accepting my next challenge. Once I knew I was able to do the distance, I desired to do it faster so I set a goal of running my next half-marathon in 2:30 (two hours and 30 minutes) and, I knew I would need to do a lot of training to get there. So, I hired Celeste as my running coach. She didn’t know it at the time, but because of her, I ran my fastest 10K – the YMCA Easter Bunny Run. Because of this, I knew she would help me reach my goal. While I was practicing running the 10K distance before the race, I was averaging 1:06-1:08. But, running behind Celeste (again she didn’t know I had my eyes locked in on her) I finished in 1:03! After the race, I thanked her for pushing me to run my fastest race and she has been encouraging me ever since. 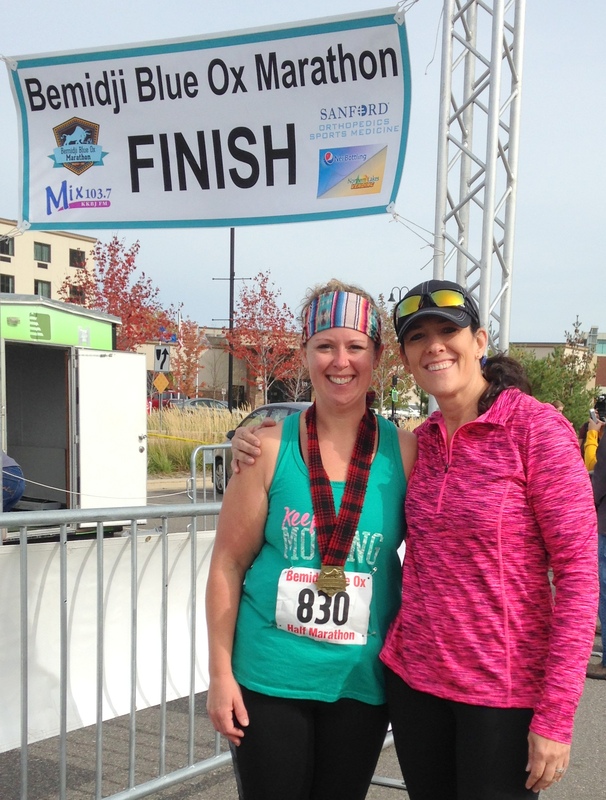 After watching Celeste push herself to achieve her goal at the Fargo Half-marathon this May, I decided to set my next goal – running my next half-marathon in 2:30. Hiring Celeste as my running coach was the best investment I have ever made! Throughout my 12-weeks of training, she was encouraging, but also pushed me outside of my comfort zone. There were several times when she checked in on me and I was feeling less then great about my runs. But every time she picked me back up and pointed out how awesome I was doing (I tend to be harder on myself then I probably should be). Toward the end of my training, life got really busy for me and I was feeling overwhelmed with my training schedule and for the first time I fell behind; and I as a result I wasn’t enjoying my running as the thoughts in my head were running faster then my feet. Once again Celeste came to my rescue and modified my training schedule to my crazy busy life schedule and again reassured me I was doing awesome and was on track. What a difference that made!!! Her words of encouragement made me feel so good inside and occasionally brought tears to my eyes. Having someone who truly believes in you is life-changing! The most rewarding part of having Celeste as my coach was her traveling all the way to Bemidji to watch me run my race! 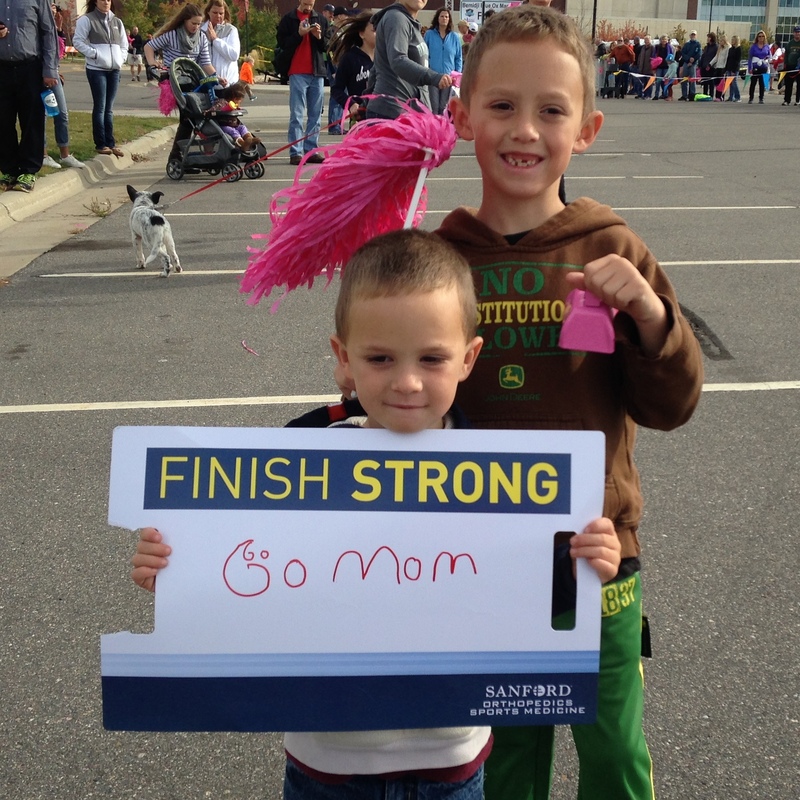 She was there at the starting line, throughout the course and at the finish line. Her positive energy pushed me throughout the entire race. The highlight of the entire 13.1 miles was when she ran/walked up a hill with me and told me how awesome I was doing, made sure I was feeling ok and told me how proud of me she was. To be honest my biggest fear was letting her down and not making my 2:30 goal. Especially, at the end of my training when I wasn’t getting my long runs in. I eventually confessed this fear to her and she assured me that I could never let her down and she was already proud of me. Seriously how amazing is she?!?!? Even though I had the fear still lingering inside, I was on a mission to meet my goal and not let myself down. I’m not going to lie, there was one mile during the race that wasn’t pretty, but I just reminded myself of all the encouragement that I had received from Celeste, how bad I wanted to meet my goal and I knew that she was up ahead of me waiting for me at the next cheer zone. So, I regrouped and continued pushing myself to the end. By the end of the race I was hurting and low on fuel, but seeing her at the end and the excitement she had, gave me that final push I needed to get across the finish line. I DID IT! I finished in 2:24:25 – SIX minutes under my goal! Reflecting back on the race, could I have finished in less then 2:30 on my own? Maybe. Would I have done it as well? Absolutely not! Because of Celeste’s encouragement and knowledge of running, I was able to crush my goal! Will I come to her again for assistance on my next challenge? Absolutely! Want more information about my running coach services? My website, Running Life, is all ready. You can check it out by clicking HERE! I am here to help. I am ready to be YOUR running coach! I can’t wait to here from you. What a great outcome for your first client. Happiness all around! Congrats to you both. Great recaps! Next Next post: November in a nutshell!